We must picture to ourselves a young soldier, who tears himself away from all the ties of his home at Milan, because the persecution there was too tame, whereas at Rome it was at its fiercest. He trembles with anxiety at the thought that perhaps some of the Christians in the capital may be losing courage. He has been told that at times some of the Emperor’s soldiers, who were soldiers also of Christ, have gained admission into the prisons, and have roused up the sinking courage of the confessors. He is resolved to go on a like mission, and hopes that he may also receive the blessing of martyrdom. He reaches Rome; he is admitted into the prisons, and encourages those awaiting their own martyrdom. Some of the gaolers, converted by witnessing his faith and his miracles, become martyrs themselves; and one of the Roman Magistrates asks to be instructed in a religion that can produce such men as this Sebastian. He has won the esteem of the Emperors Diocletian and Maximian Hercules for his fidelity and courage as a soldier; they have loaded him with favors. This gives him an influence in Rome, which he so zealously turns to the advantage of the Christian religion that the holy Pope Caius calls him the Defender of the Church. After sending innumerable martyrs to Heaven, Sebastian at length wins the crown he had so ardently desired. He incurs the displeasure of Diocletian by confessing himself a Christian. The heavenly King, for whose sake alone he had put on the helmet and soldier’s cloak, was to him above all Emperors and Princes. He is handed over to the archers of Mauritania, who strip him, bind him, and wound him from head to foot with their arrows. They let him for dead, but a pious woman named Irene took care of him, and his wounds were healed. Sebastian again approaches the Emperor, who orders him to be beaten to death in the circus, near the imperial palace. Defender of the Church, as the Vicar of Christ called thee, lift up thy sword and defend her now. Prostrate her enemies, and frustrate the plots they have laid for her destruction. Let her enjoy one of those rare periods of peace during which she prepares for fresh combats. Obtain Christian soldiers, engaged in just wars, the blessing of the God of Hosts. From The Liturgical Year by Dom Prosper Gueranger, O.S.B. He is handed over to the archers. He survives and is nursed in the prison by the pious women, below. He finally dies after being clubbed to death, below. 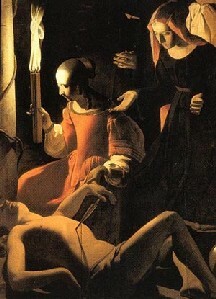 One can take important historic information from this eloquent selection about St. Sebastian by D. Guéranger. St. Sebastian was a young military man living in Milan who resolved to go to Rome to help the Catholics who were in prison awaiting their execution. It is easy to imagine that many, for different reasons, would have feared martyrdom. 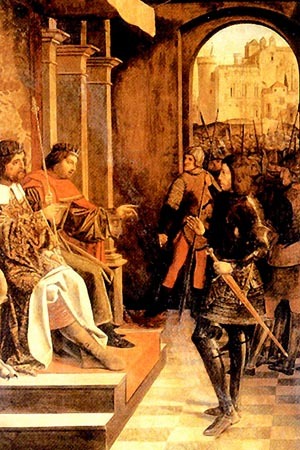 There were two kinds of Catholics who faced martyrdom. First, we have the true martyrs who faced death and considered it an honor to die for the Church. But, second, we have those who were called lapsi, the ones who became afraid to die and denied the faith. After that shameless sin, some returned to the catacombs to ask forgiveness, and remained there spreading their cowardice to those around them. The number of martyrs was great; but the number of lapsi was also high, and the latter exerted a bad influence over the ensemble. Therefore, those early Christians who were in prison waiting to die in the arena ran the serious risk of apostasy. This is why Catholics who belonged to the imperial army, protected by their military condition, used to go to the prisons and encourage the prisoners, stimulate them to remain firm, and speak with them about the things of faith to give them confidence. 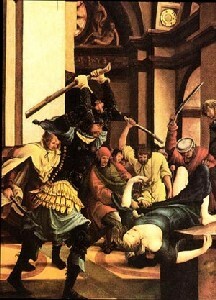 St. Sebastian, therefore, went to the very center of the persecution with the intention of helping the prisoners. He obviously realized he was exposing himself to the persecution. He was known by the Emperors and was chosen by them to be commander of the Praetorian Guard, a very powerful military unit that defended the Emperor. The commander of this guard not only directed this division, but he exercised a strong influence over the whole army; he was something like a Minister of Defense. 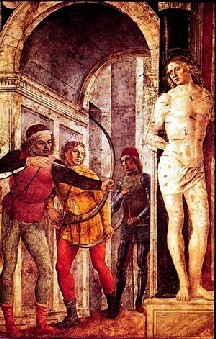 Notwithstanding his position, St. Sebastian confronted the Emperor. When questioned, he defended the Catholic Faith. For this reason he was taken to the famous column where he was bound and shot with countless arrows. He survived, and later had another trial and was condemned to death. This time he died. You can imagine the young man, with the aura of the grandeur, power, and prestige of commander of the Praetorian Guard, going by night to the prisons looking for the Catholics in order to encourage them. He addresses with charity some old men and women here, several youth there, persons of all social conditions. He stimulates them to persevere, to stand firm in the good position, to be eager to meet Our Lord soon. He knew, naturally, that his action would be denounced and bring martyrdom for himself also. But he tranquilly faced such a risk, he who was accustomed to face risks. He faced it with that superior deliberation of a man who had chosen to take up the Cross of Our Lord Jesus Christ. He did not tremble, he did not hesitate, he always remained master of himself, always heroic. During the two martyrdoms he suffered, he sustained this same tranquil attitude: the serenity of a soldier facing death, the soldier of Our Lord and of Our Lady. The glory of St. Sebastian is the glory of the warrior. It is the glory of the hero who exchanged the risk of the war to face the higher risk of the arena. He did so tranquilly and led many souls to Heaven; and finally, he became a martyr himself. We should ask St. Sebastian for the understanding of the moral profile of the Catholic hero. We should also ask him to obtain from Our Lady the grace of defeating the false piety that presents the saints to us in a sentimental and fake way.